Having a patio built at your home in Bluffton, South Carolina, will provide you with a versatile outdoor space that you can use for everything from relaxation to backyard barbecues. If you’ve decided to make this investment in your home, it’s important to find a trusted company to complete the job. Having your patio installation performed by experienced builders who use top-quality materials can mean the difference between having a beautiful, long-lasting patio and one that cracks and becomes unsightly in the near future. At Porch Outfitters, we have installed countless patios over the course of more than 25 years. Our team is comprised of our own highly trained and experienced installers – not subcontractors – who will build your patio according to best practices, ensuring every paver is completely level and secure. To ensure your patio remains beautiful and stands up to daily wear for many years to come, we only use the highest quality materials. For example, we use exceptionally durable pavers from industry leaders, such as Belgard, which are available in a wide array of shapes and colors. And, if you’d prefer a natural stone patio, we can provide fine stone materials, such as travertine, bluestone, and marble. As outdoor living specialists, we can build your patio in any size or configuration to meet your precise needs. Plus, we can add virtually any other outdoor living product you may want, including a pergola, sunroom, screen enclosure, or even an outdoor kitchen. 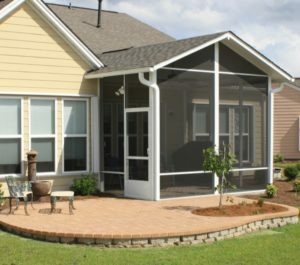 Contact Porch Outfitters today to learn more about why homeowners in Bluffton, SC, have trusted their patio installation to us since 1987.